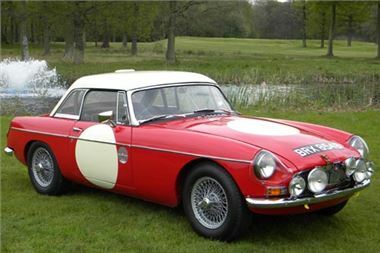 The Historic Racing Drivers Club will present a package of races in 2012 to celebrate 50-years of the MGB as a competition car. After an approach by Barry Sidery-Smith - the acknowledged 'Godfather' of MGB racing in the UK - the HRDC will host a collective of 30-minute, single-driver races for FIA-Appendix K-type historic MGB cars, with an invitation class for historically interesting MGB-derived race cars, such as the WSM MGB and the Jacques Coune-built MGB Berlinette. HRDC founder and race director, Julius Thurgood, was upbeat about this new project: "I was thrilled to be asked to help stage these events by Barry. 'Sideways' got me into racing in the first place and made sure that I bought the right car to start with - the ex-Neville Marriner Prodsport MGB, which I ran successfully in the first Willhire 24-Hours some 30-odd years ago. Like so many would-be competitors that Barry has helped and mentored over the years, Barry took me under his wing and introduced me to circuits such as Spa, Nurburgring, Zandvoort and Chimay. "From a personal point of view - like so many other competitors racing today - I owe Barry a great debt of gratitude for that great start in motorsport. Helping Barry to properly celebrate 50 years of the MGB in racing is a fabulous way to say 'Thank You' to a man whose generosity of spirit has helped so many enjoy this great sport". The inaugural race for the HRDC "MGB50" will take place at Castle Combe on 9 April 2012, at the HRDC 'Historica' race day in association with the Castle Combe Racing Club. Barry Sidery-Smith - who started racing MGBs at an International level in 1965 - will, of course, be entered in his famous ex-works Le Mans MGB 'DRX255C', which will be supported by many of the ex-works and works-associated MGB racers. Applications to race in HRDC "MGB50" can be made via the HRDC website at www.hrdc.eu.